The difference between ska, rocksteady and reggae may be lost on casual listeners, but even without an academic understanding of Jamaican music’s evolution, rocksteady’s slower tempos, heavy backbeat and harmony vocals will get listeners on their feet. 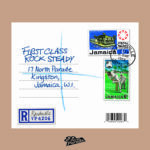 In celebration of rocksteady’s fiftieth anniversary, this forty track set pulls together some of the short-lived, foundational genre’s most important tracks, including Roy Shirley’s prototype “Hold Them,” Hopeton Lewis’ genre-defining opener, “Take it Easy,” material from internationally renowned exponents Desmond Dekker and Johnny Nash, and deep, collectible tracks from Jamaica’s greatest musicians. This entry was posted on Wednesday, July 6th, 2016 at 2:11 pm	and is filed under CD Review, Five Stars, Reissue, Video. You can follow any responses to this entry through the RSS 2.0 feed. Both comments and pings are currently closed.